Every time Sam the dog goes into the front yard two Northern Mockingbirds appear as if from nowhere and they are both in a state of wild rage directed towards Sam. 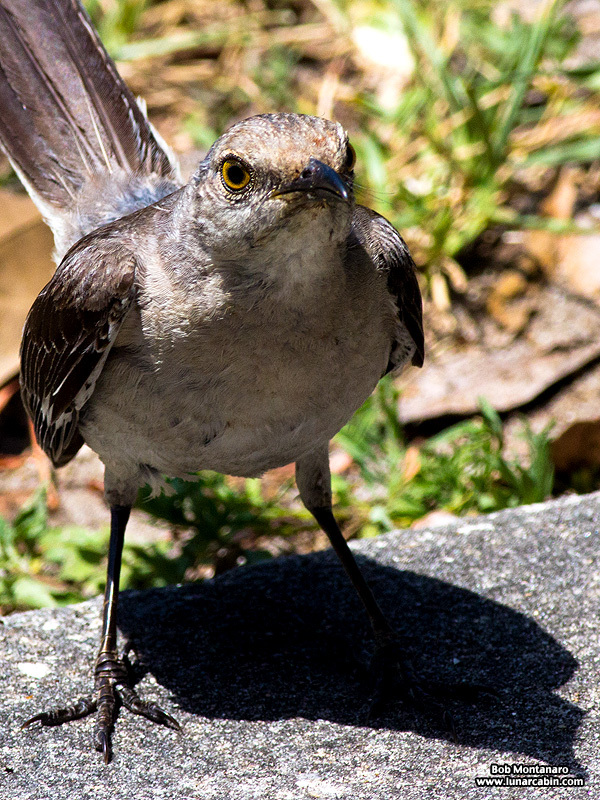 The Mockingbirds are defending their territory, of which my front yard belongs to them, and they must be defending a nest otherwise it is hard to fathom what else might set them off. Especially since the rest of the year the birds leave Sam alone when he makes an appearance. Today one of the Mockingbirds landed on the ground right in front of Sam and proceeded to shriek at him relentlessly. Sam shrugged it off, much to the disgust of the birds who took to dive bombing him, sometimes striking his back with their talons. Again, Sam took it all in stride, uninjured, and acted like nothing was out of the ordinary. We spend more time in the backyard now where the Blue Jays reign and seem to tolerate Sam with a certain ambivalence.